For many a backyard swimming pool is just part of living in Australia, thanks to glorious weather and long hot summer days. Unfortunately, with the need to fit more people into an area the average size of a block of land is getting smaller and this is making people wonder if they can even fit a pool into their small yard. The good news is the answer is YES! The success of a good pool design isn’t actually in it’s size, it comes down to other factors – good design, form and function. If a pool looks good and it works, then it doesn’t really matter what size it is. 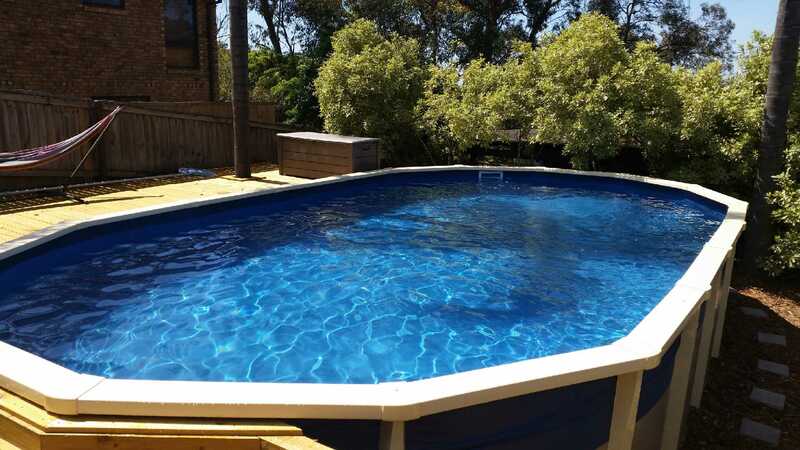 Of course having a smaller pool can restrict some functional elements – such as being able to swim laps, so when planning an above ground swimming pool, you may have to re-evaluate your expectations. When it comes to children though – give them some water and they’ll have fun no matter how deep or big that water is. For adults a comfortable area to sit in a small pool, under some shade with a glass of wine or a beer – it’s a great way to enjoy a summer weekend. When designing a small space for an above ground pool there are some things you need to consider from a functional, aesthetic and compliance point of view. Always consult professionals – small areas are more challenging than larger backyards, so every centimetre counts – you need a great design! If you want to have a go yourself the following tips should help. Consider your space – be aware of your proportions so make sure your above ground pool will fit the space and area perfectly. You want your pool to look like it belongs, rather than completely dominating the area. The same goes for a large pool – you need to ensure the pool takes up the right amount of space so it doesn’t get *lost* in the yard. Position – where possible make sure your pool is located close to a boundary or boundaries with a sunny afternoon aspect to keep the remaining space clear and open. Pool fencing – by law you will need to have a pool fence installed, this may or may not detract from the functionality of the remaining space in your yard, both inside and outside the pool area. You may be able to use the pool wall as a boundary if the pool is 1200mm off the ground. All you may need is a pool compliant gate at the base of the steps that lead up to pool level and if you have the right boundary fences your safety elements may be covered. A well designed above ground pool can enhance your family’s lifestyle and create lifelong memories. Don’t let having a small yard put you off getting a pool.